This is our ProBoom® Elite series Extended reach Mic boom model, with two long armatures, and adjustable spring tension points. This arm was originally designed exclusively for RCA. 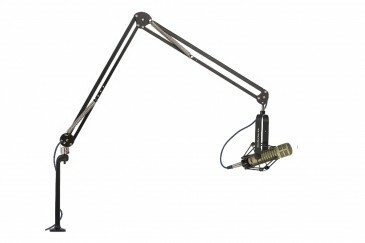 It features a 45" total reach, and has the capability to adjust the spring mounting points. This allows for increased spring tension, to hold up heavier microphones, without the need to purchase new armatures or springs. The preload is increased, resulting in the perfect tension for some of the heaviest microphones on the market. This Deluxe model features the standard 12" vertical riser, and choice of finishes. Squeak-free performance is a staple in our Mic arm line. 5/8-27 threaded mounting stud also included standard.